An unusual “piano” is coming up for auction on May 20 (2017). This is an Orpheus Mechanical Piano (sometimes known as a mechanical zither). 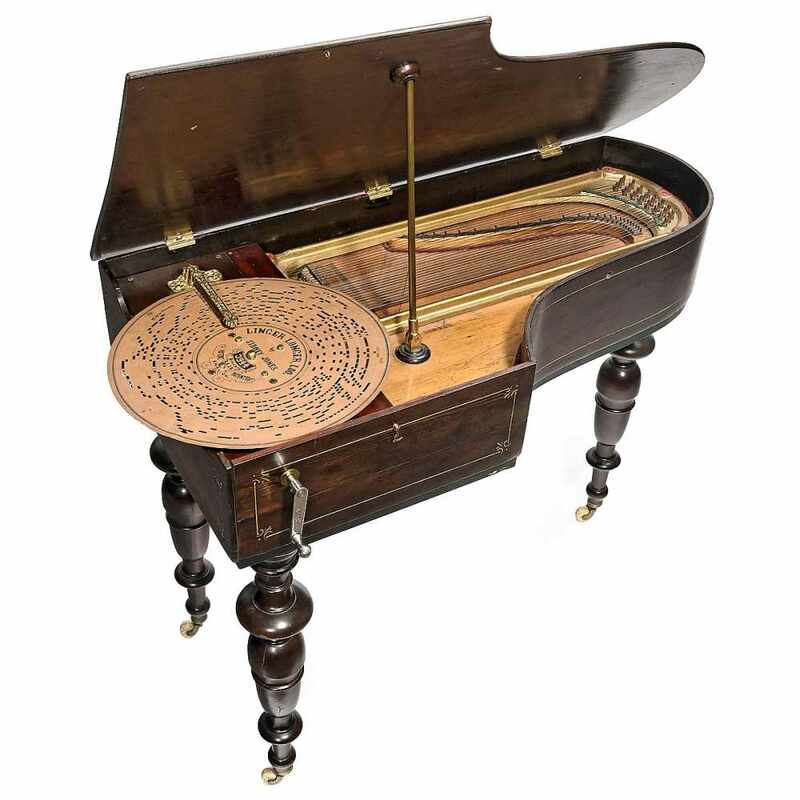 The instrument has a small iron frame housed in a stained wooden case, similar in shape to a grand piano. There are two major difference between the Orpheus and a conventional piano. One, it has no keyboard; and two, it is barely three feet in length (35 x 18 x 25 inches, to be precise). The Orpheus has a compass of 24 notes, all single strung. The disc is divided up into 24 concentric circles. 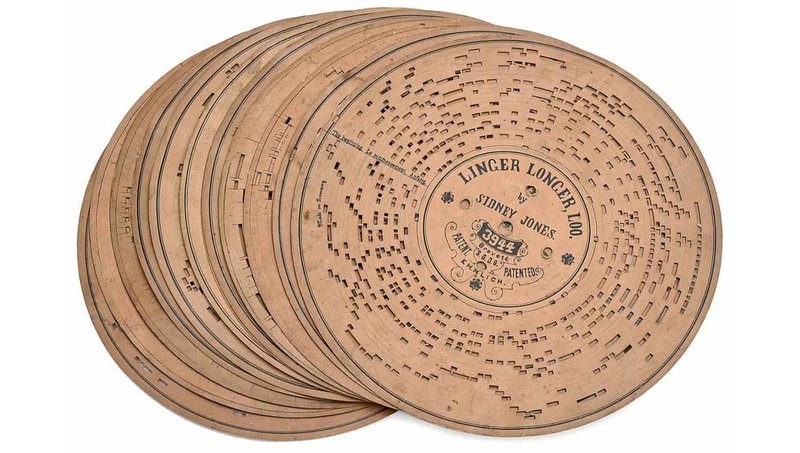 Each ring has a hole cut when the respective note should sound. A single revolution of the disc plays the song once, and lasts approximately 45 seconds. In effect it is a very primitive digital disc playback system – much like a CD! This Orpheus was probably manufactured around 1899 in Leipzig, Germany, by Musikwerke Ludwig & Co. In 1900 Deutsche Grammophon took over the company. Paul Erlich and Co. (again based in Leipzig) made the discs and readers. These player mechanism appeared in various musical automata of the time, including music boxes, organs, etc. This, the Ariston system, featured over 4,000 titles. The guide price for this piano, which is apparently in good condition, along with a set of 12 discs, is 1,800 to 2,800 EUR. The sale is being held by Auction Team Brecker (Köln, Germany), as part of their Science & Technology, Mechanical Music & Automata Sale.